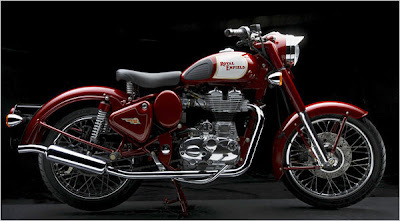 Royal Enfield's dramatically new and yet boldly retro C5 motorcycle fully deserves the notice of The New York Times. It's still exciting to see it happen. Times writer James Parchman visited the factory in Chennai, India and rode a new C5 on the test track. He does a fine job of explaining to his U.S. audience why this new motorcycle is at the same time old and why it's an important development although it's not the fastest, cheapest, finest or most expensive motorcycle on the market. "The Bullet Classic C5 (not to be confused with the Bullet Classic, a much older design, or the Bullet Classic G5, a model that uses the newest engine in an older chassis) went on sale in Europe late last year. 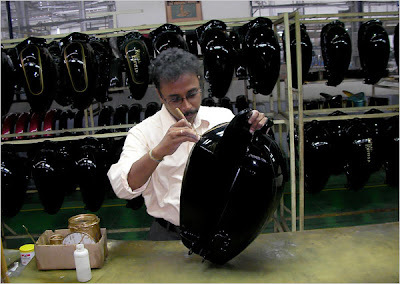 The first production bikes destined for the United States began rolling off the assembly line here at the Thiruvottiyur factory, where Bullets have been made for more than 50 years, in mid-February and are expected in showrooms next month. "To say that the C5 is a striking motorcycle or one that looks to have been lifted directly from a motorcycle museum is no overstatement..."
"With the Bullet Classic C5, the Royal Enfield designers have succeeded in building on the Bullet heritage and in their interpretation of retro-classic British style." "It retains the trademark cadence of a thumper, but now the engine and transmission, formerly separate components, have been integrated to create the Unit Construction Engine. The UCE, as Royal Enfield calls it, is fuel-injected and designed to be efficient, reliable and environmentally friendly. It will be used on all Royal Enfield export models." "In some circles, this introduction is bigger news than the debut of the Tata Nano; if the past is any guide, the next all-new Royal Enfield Bullet won’t arrive for another half-century." I'll bet Royal Enfield can beat that. James Parchman was described by Kevin Mahoney, who is quoted in The Times article, as a freelance writer and photographer.